I mean, Zeppelins, dinosaurs (pterosaurs, whatever), what's not to like? UPDATE: The picture was a movie poster for the never made Hammer film Zepplins vs Pterodactyls. For some reason the link has stopped working. So, you'll just have to visualize Zeppelins and biplanes fighting the giant flying Pterosaurs. Sigh. UPDATED AGAIN: I found a picture of the original British movie poster. So here you go. Man, I'd love to see a remake of the this. I love Airships, I find them fascinating. I would have given anything to see the Graf Zeppelin or the Hindenburg, or the USS Shenandoah, USS Macon, or USS Akron in their glory days. And Pterodactyls in full combat with biplanes, Man, it just doesn't get any cooler than that. Probably needs to star Wil Smith, just for full effect. Until somebody gets around to it, I guess I'll just have to settle for the I Am Legend remake of the Omega Man. And AGAIN: Hammer Films never made this movie, but they'd taken the idea from an old Republic Saturday matinée serial from the 1930's. Like everything else in the world, that clip can be found on YouTube. I'm not quite sure what's going on, but you've got to love the flying wing and the actual footage of the zeppelins. See if you can spot the big name actors, hint a stunt man named Marion Wayne makes a very brief appearance in the Zeppelin gondola. Having some trouble here, Jim. With your mad skillz, you can't cobble together a picture for your masses to enjoy? zoomy and squawky goodness in my minds eye. Also, chain gun fire. Hmmmm. But what we really need is for the pterosaurs to spit fire!. Or laser death rays! Oh baby, I can see the Zeps exploding even now. 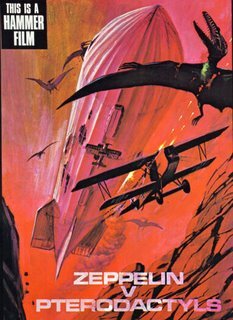 The 1930s Zeppelin vs. Pterodactyls wasn't really made by Republic Pictures, or made in the 1930s. It's a mashup cobbled together from old Republic serials and a few other movie clips. Some clues that it couldn't have been made in the 1930s were Terrence Stamp (who would have been six years old in 1936), and the "Wilhelm Scream" which started in the Fifties. Here's a list of all the movies were excerpted in it. deidzoeb, thanks for the correction and the update. It's a great idea, love to see a real version of it some day. With all the crap out there, I'm surprised somebody hasn't taken a whack at it.